Working on my own Gulch. Subject: Working on my own Gulch. 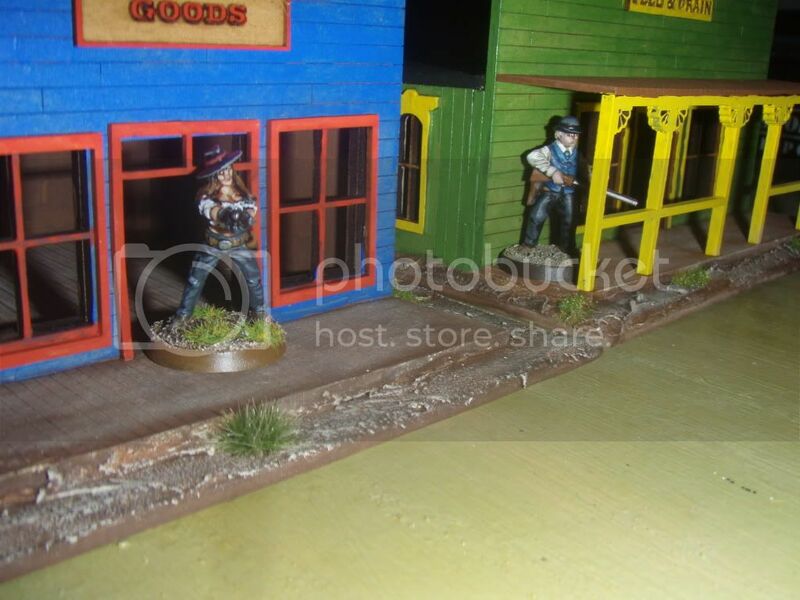 Yesterday was a rare productive day for me; I made some headway on some Blackwater Gulch Miniatures and have mostly assembled three of the Gamecraft Miniatures Buildings. A building in all its unassembled nekkidness, with free candy from GCMINI. Subject: Re:Working on my own Gulch. The coloured buildings painted easily enough with a brush and the odd coloured craft paint, the blemishes are an enhancement. I had issues with the church; when you do a white building either spray or airbrush it, it will save you some misery. The belfry didn't go together well; I'll have to see if I can undo it and try again; otherwise, these buildings were a snap to do. Progress is progressing; the roofs were stained with Minwax instead of paint. Finally added the front porches; they were somewhat fiddly, but they eventually relented to my efforts. A slight closeup; I've been making the fence by hand; it looks well without too much work. The Belfrey on the church is still a bit problematic; it'll need some work. The chapel itself is really good; the problem is the two side panels on the belfry. a little beveling should get em right. I'd still recommend it. I had to use a micro saw and Xacto blades to get the Church Belfrey to sit right without gapping.. and in the process I managed to screw up the roof of the vestibule.. I still like the church.... I'll get it sorted out shortly. I've been considering the Mojo Riverboat to add a dock to my layout. 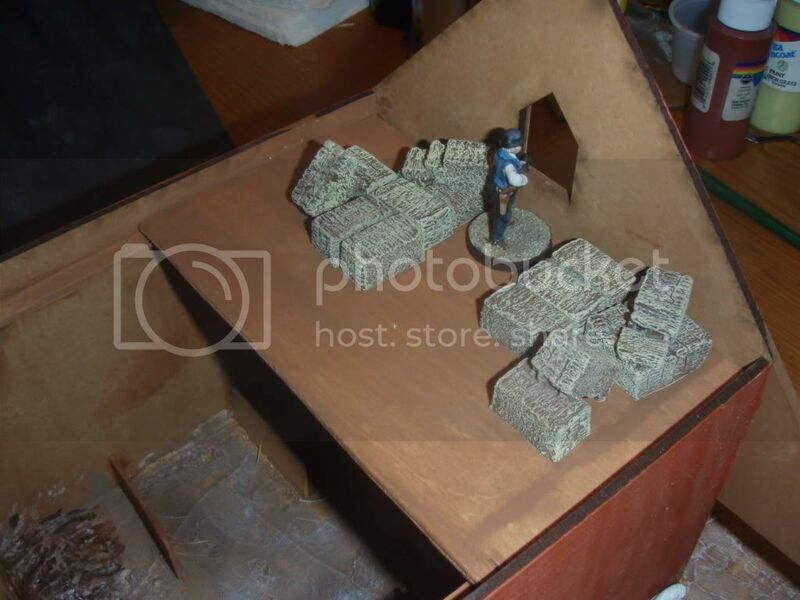 I have some layout planning to do, I'm considering whether I should go for the more flexible flat table with built-up terrain or go with a relatively static terrain which will allow me to make more sunken terrain features such as gulleys, wadis, streambeds and my dockside. If you do, I'd love to get some pictures. Assuming you don't mind us putting your work on our website. Curses to USPS and their shipping speeds! Getting a decent idea how and where things go on this kit; started with a pile of random wood...now I'm a little more relaxed and enjoying this. I have a compulsion to sing the venerable Honey Comb theme .......it's not small......no, no no! This is a dry-fit of the bulk of the parts..... I'm actually a lot further along, I just haven't taken the photos yet. I have a lot of the preliminary work completed on the boat; the bulk of the model goes together well without glue; this might be a benefit for long-term storage. I'm off today for Columbus Day; stopped in at Menard's and picked up a 4'x 4' sheet of some wood-like material after dropping off the Missus (she has to work today). I placed it over a "found" 4'x4' frame that somebody tossed out. (it pays to be a Mailman, sometimes). Test fitted some of my collection (as well as some "ghost" items to give me a feel for what I can assemble. The Riverboat will occupy a substantial portion of the board. We gave our photography piece away as a prize a while ago, I forget how big it is sometimes. I've been taking a breather, for a bit; working on other projects; housework, and assembling a "Bolt Action" U.S. Paratrooper Army for my Son for Christmas. I picked up a suitably sized plastic train for around twelve bucks, today... I'll throw it under the Christmas tree. Finally ordered the New Rulebook and the New Card Set..... I recently purchased the Gamecraft Train Station.... It looks like I'm getting back in the Saddle Again. Life has been very busy up to this point; six-day work weeks since November, things are starting to level off. The most recent purchase was the 4Ground Stagecoach, it came in yesterday, I didn't realize that the models were pre-coloured (I'm sure it has been mentioned to me, I'm just a little slow sometimes); it is a very intricate kit, patience will be the order of the day; I may trick one of my daughters in building it for me. I previously bought a small two-wheeled cart. 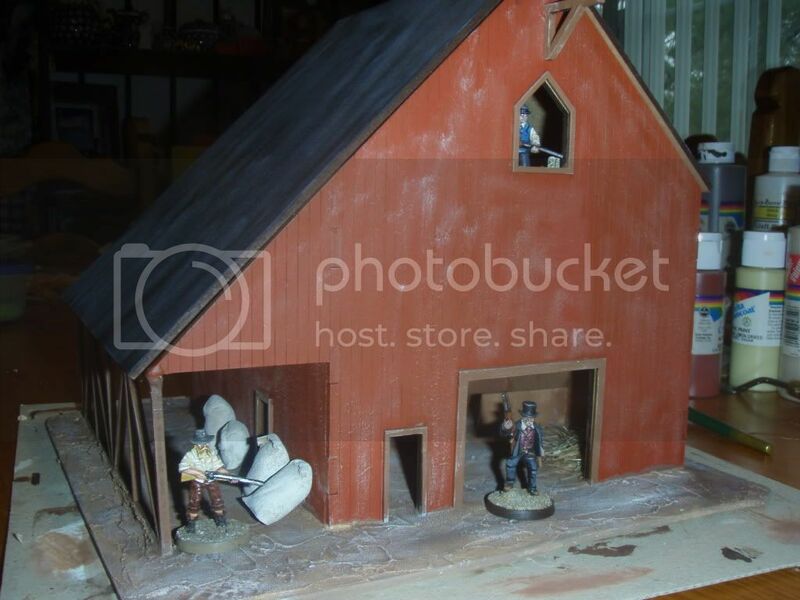 Two buildings from TRE Games https://tregames.com/collections/28mm-structures, The Town House, and the Farm Building. I'm happy with them both, I felt obligated to buy the Town House, since he asked if there were any suggestions, I mentioned a city residence/ back row to Western Downtown mercantile Façade structures. He made it, I bought it. I found a Christmas/Holiday train which I'll convert and paint up. I cut up the battery compartment which would allow a figure to occupy the cabin of the main engine; painting and weathering should make it look good. I found some bargain pine trees for Christmas displays, I bought them on reduced price from the local big chain hardware store. minor issue, they have a touch of "snow" on them. Bought some bargain picket fencing from a company Darice...18" x 1" for about two bucks each; the pickets are held together by flexible wire, making them very adaptable. I'm really looking forward to seeing your board set up and with minis. Great job so far. Great looking set up. I have a few Gamecraft buildings and like them quite a bit. One thing I was worried about was them coming apart when stored, so I put each on a base. I also got some wood plank plastic card to use as flooring (before Gamecraft offered floors) and put it in. 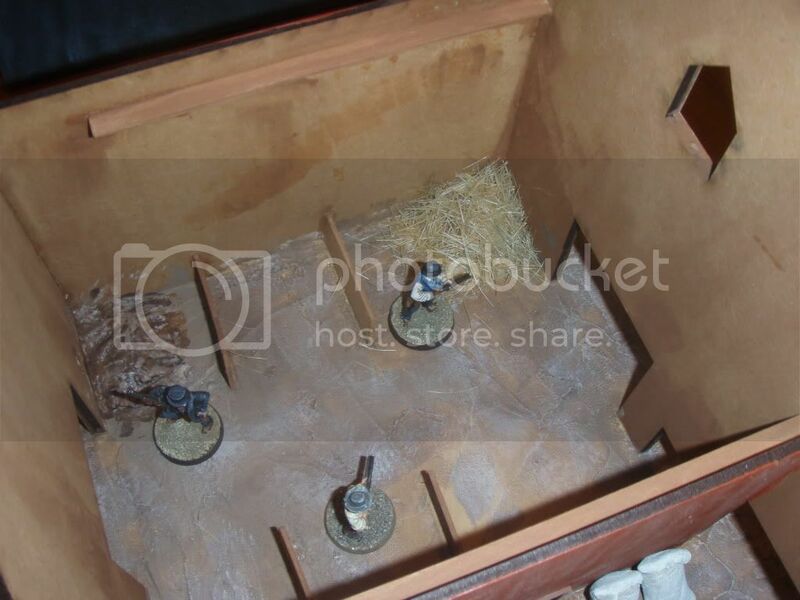 I did keep a dirt floor for the barn, but using a base helped me put in stalls and I also built a hay loft. The buildings are definitely not as fancy as some of the 4Ground stuff, but for the price you can make them look pretty darned good I think. I've been meaning to do that with some of my gamecraft buildings too. Adding a base will make them a lot more sturdy. I have a couple that broke probably because I didn't glue them good enough. I think the next time I invest in some new buildings I will probably go with 4 Ground. I got a bunch of their fantasy buildings and they're really nice and sturdy, and even though they're in the UK if you place a big order you can get free shipping. I forget how much you need for free shipping, it was either $75 or $100. 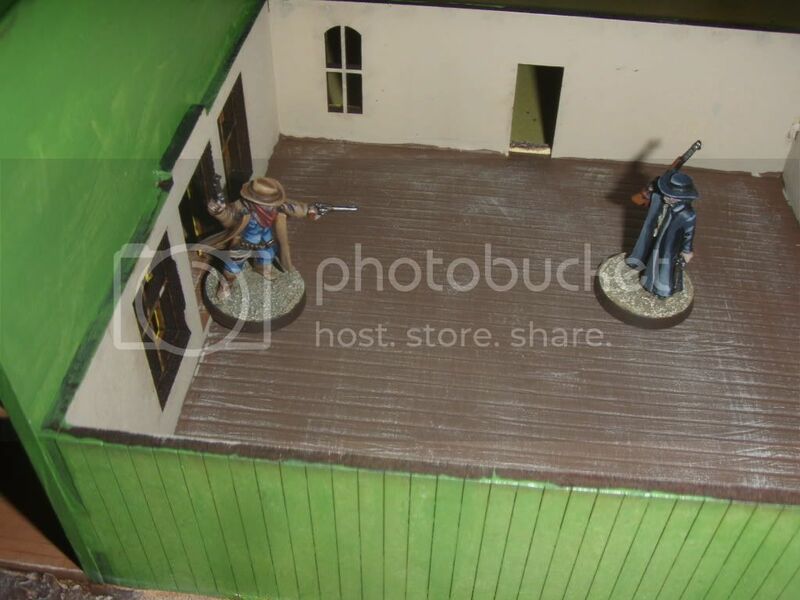 I'd love to see them put together a giant saloon kit like their big fantasy tavern kit. It's super expensive but would be a great centerpiece.